Rabbi Michael Dov Weissmandl (1903-1957) was the first European Jewish leader to urge Allied leaders to bomb Auschwitz and the railway lines leading to it. Weissmandl (1903-1957) grew up in Slovakia and became a prominent figure in the famous Nitra Yeshiva. When the Germans began deporting Slovakia’s Jews to Auschwitz in the spring of 1942, he and his cousin Mrs. Gisi Fleischmann, a Zionist and community activist, established an underground rescue organization known as the Prakova Skupina, or Working Group. Their efforts included smuggling hundreds of Jewish children across the border into Hungary, which at that point was a safe haven. Most notably, they paid a $50,000 bribe to Nazi official Dieter Wisliceny to halt the deportations. From the autumn of 1942 until October 1944, no Jews were deported from Slovakia. 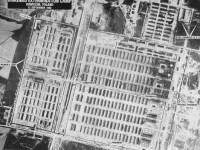 Although some information about the mass killings in Auschwitz leaked out earlier, the full details of the camp’s operations were revealed in late April 1944, when escapees Rudolf Vrba and Alfred Wetzler reached Slovakia. They gave Rabbi Weissmandl and his Working Group colleagues a thirty-page report explaining the mass murder process, including maps showing precisely where the gas chambers and crematoria were situated. The report was sent to U.S. and British diplomats, officials of the Vatican, and Jewish rescue activists in neutral Switzerland, together with letters from Rabbi Weissmandl urging the Allies to bomb the death camp. “We ask that the crematoria of Auschwitz be bombed from the air,” he pleaded. “They are sharply visible, as shown on the enclosed map. Such bombing will delay the work of the German murderers. What is more important–to bomb persistently all the roads leading from Eastern Hungary to Poland and to bomb persistently the bridges,” over which thousands of Hungarian Jews were being deported in cattle cars bound for the death camp. The rabbi’s appeal reached the Roosevelt administration, which turned it down. Sources: Wyman, The Abandonment of the Jews, p.290; Medoff, FDR and the Holocaust, pp.170, 186-187, 200.